Designed to be the microscope to teach and train you as you begin your career, the BA-200 is adaptable to be a long-term instrument of observation and analysis regardless of requirements. 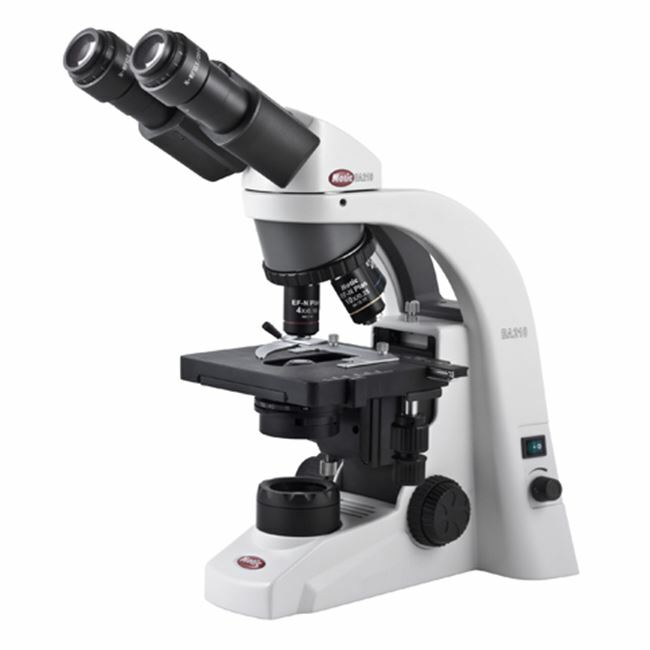 The BA200, at its core, is an adaptable microscope designed to fulfill the needs of educators and trainers, however the microscope with certain accessories can be expanded to meet other fields' requirements. The basic format of the microscope is a combination of the Colour Corrected Infinity Optical System [CCIS®] in both the internal optics and the EF Plan objectives within an attractive stable microscope body that produces crisp and flat images up to a field flatness of F.N. 18. Observing images for hours on end is a fatigue-free experience with the BA200 thanks to the user friendly features of an observation angle of 30° and the high eyepoint system employed by the eyepieces. The flat fine focus wheel [minimum increments of 2 mm] with its low position reduces the strain on the user's wrist from the act of adjusting focus. Moreover, exploring the slide is hassle-free experience with the standard mechanical stage, which has a movement range of 76 x 50mm. Overall the BA200 is a system of options to adapt itself to you, beginning with three choices of siedentopf heads [binocular, trinocular 20/80, or trinocular 0/100] to three choices of critical illumination [20W/6V halogen, 3W LED, or mirror system]. With the BA200's N.A. 1.25 condenser with slider stop, you further have the option of inserting a simple Phase Contrast slider [10X/PH 1 or 40X/PH 3] or a simple dark field [10X - 40X] slider.